Recently, I decided to create a custom automated workflow for curating and sharing content to my social media accounts. What follows is an account of how that social media automation failed, and what I learned from it. A while ago I was inspired by this article from Jamie Todd Rubin. I have been using pocket in roughly this manner for a while: as a catch-all for web items that I want to “look at later”. For a while, I used it to read, and then share items to my Buffer (an awesome social media sharing app). That worked fine, until it became tedious to remember to do this every time I got done reading an article. Also, sometimes, I would get interrupted and forget to do this step. My next improvement was to just bulk-read posts, and tag the ones that I wanted to share with a “buffer” tag. Later, I would go in and add these posts one by one to my buffer account. Again, this worked for a while. It wasn’t really any less tedious, but it was less annoying (at least for me). I tend to be one of those people that works well when I cluster tasks together. But I wanted something better. A system that was much more automated. I’ve been obsessed for a while with the idea of automation workflows. In fact I’ve used them via Zapier and IFTTT for years to automate other tasks. So, I did a little research. My first stop, as usual, was IFTTT. It is a simpler version of automation that I use before Zapier. Mostly because it’s free. After a while you have to pay for Zapier. I have paid for Zapier in the past, but at the moment I’m trying to save money anywhere I can. IFTTTs solution worked except for one issue, you can’t share to multiple accounts within buffer. Since I would use the service in this way, that meant it was out. Next came Zapier. It had been a while since I used Zapier for anything very complicated. Imagine my surprise when I logged in to my account and found out that I could create “multi-step” Zaps. Effectively, this would allow me to do what IFTTT wouldn’t! Note: I did end up paying for Zapier at this point, because multi-step zaps are not included in the free version, but I was happy to pay for these extra features. So, I got to work creating a Zap that would take the items in pocket with a specific tag and auto-share them through Buffer. It took me roughly 15 minutes to set up and turn on. Of course, I tested it to make sure I was good with the way it worked. It had been running for a few weeks, and I loved it! I was saving time, and I didn’t have to worry about remembering to share content to Buffer, because it was apart of my everyday todos to read articles and tag them in Pocket. That section outlined in red in the image above is the excerpt that was pulled from the article. 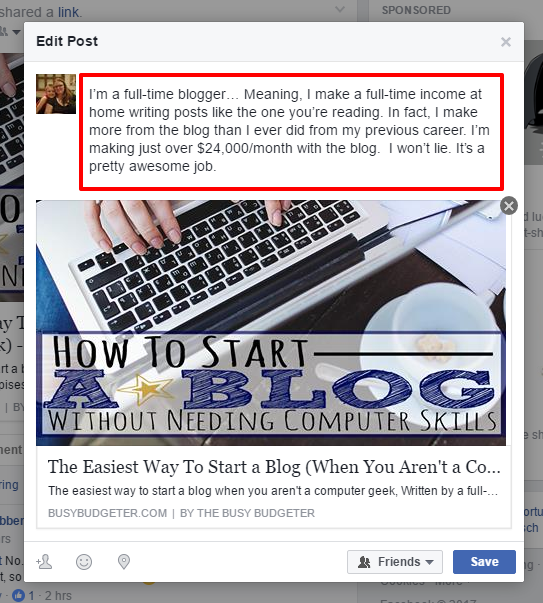 The first problem is that I definitely don’t make that much money blogging. That would be nice, though, right? The excerpt that was pulled in from Pocket made it look like these were my own words. Not really a big deal in the large scheme of things, but it’s not true. I try very hard to avoid that. Also, pulling the excerpt as a separate item was unnecessary for Facebook. I temporarily forgot that Facebook pulls it’s own excerpt out of the page and puts it into that nice little “preview” window. So, adding the excerpt, in this case, is not only unnecessary, it’s also confusing. I only found out about this issue when one of my friends congratulated me. At first, I was confused, then I looked at the post and realized what she was seeing. Needless to say, I went in and manually deleted that excess excerpt, and then edited my Zap to take it out of future buffers. Now I have a new problem, though. Any links I share will consist of just the image, title, and excerpt preview. For me, this feels unfinished. I like to add my own two cents and explain something I found interesting or insightful about what I’m sharing. It’s not really a big deal, but now I’m less excited about the social media automation that I tried to set up. What I want is a step in the automation where I can add my own observations or notes into the post before it goes out. Sadly, you can’t attach notes to pocketed items, and even if you could, that’s not information that you can harvest in Zapier. I know, I looked. You also can’t create drafts in Buffer, which would be another nice work-around. I thought of maybe adding the article information into a Google Sheet, or, possibly, Evernote. Then make a separate Zap where it will pull out that information (once I’ve added my note) and insert it into Buffer, but I’d like something with less steps. So, I’m on the hunt. I’ve already come across several options that may work. I won’t know without testing and tweaking, though. Once I get a better system down, I fully intend to reveal it so that other people can save time curating and sharing content to their social media accounts. Now, over to you. What do you use to save time curating and sharing content? 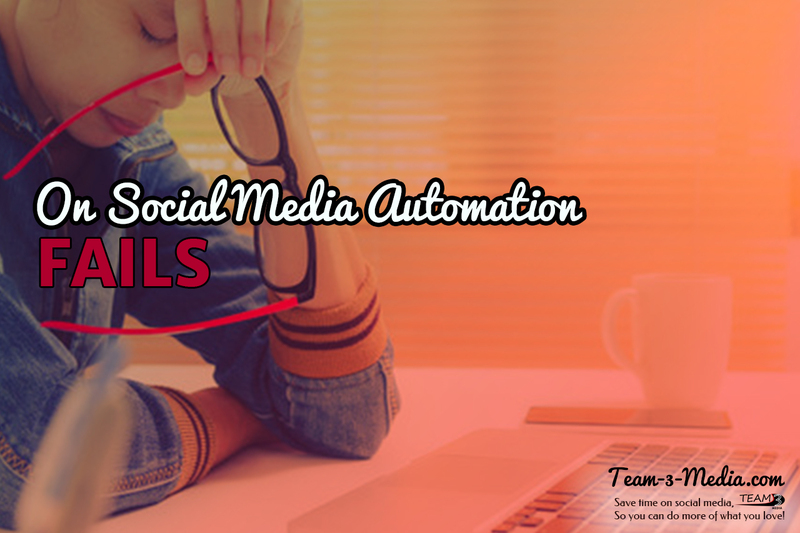 Do you have any social media automation tips? Or do you have your own automation fail story that we could learn from?